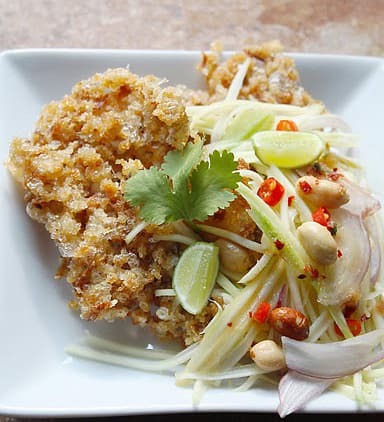 In Thailand, this would be made with catfish, a tasty river fish that is popular throughout Asia as its texture is perfect for frying until crisp. To make this recipe, choose a fine-textured to make it easier to fry. Green apple can be substituted for green mango. Serve the salad at room temperature, or cold. Stream the fish fillets in a steamer for about 10 minutes. Remove from the heat, pat dry with kitchen paper and use a fork to break the fish into pieces. Heat the oil in a medium, heavy-based frying pan, deep enough for the oil to cover the fish. Coat the fish pieces in the flour and deep-fry until golden brown. Remove the fish from the oil and drain on kitchen paper. Tranfer the fish pieces to serving plate and top with grated green mango. To make the sauce put the fish sauce, lime juice and palm sugar in a bowl and stir until the sugar ha dissolved, then add the shallets and chilli. Mix well and pour over the fish and mango salad. Scatter ove the cashew nuts and coriander leaves and serve. Preparation and cooking time: 30 minute.